I’ve gotten emails from some of you regarding my recent post about NumisNetwork. Thanks to those who wrote in, and as a reminder, you’re all welcome to email me with questions or feedback. It helps me to know what you find useful and what’s less so. The emails wanted to find out more about why I didn’t recommend joining NumisNetwork. My response to them, and you, is two-fold. First, I don’t trust MLMs. This article does a great job of explaining the problems with them. In short, they’re not sustainable and don’t benefit their members in the long run. Second, collectors can assemble a great collection of coins without NumisNetwork. Collecting on your own lets you maintain a budget. If times are tight and you want to stop buying coins for a month or two, you can. With NumisNetwork, you’ll keep getting the monthly coin (and paying for it) whether you want to or not. I was surprised by the response of one member of NumisNetwork who had done their homework. 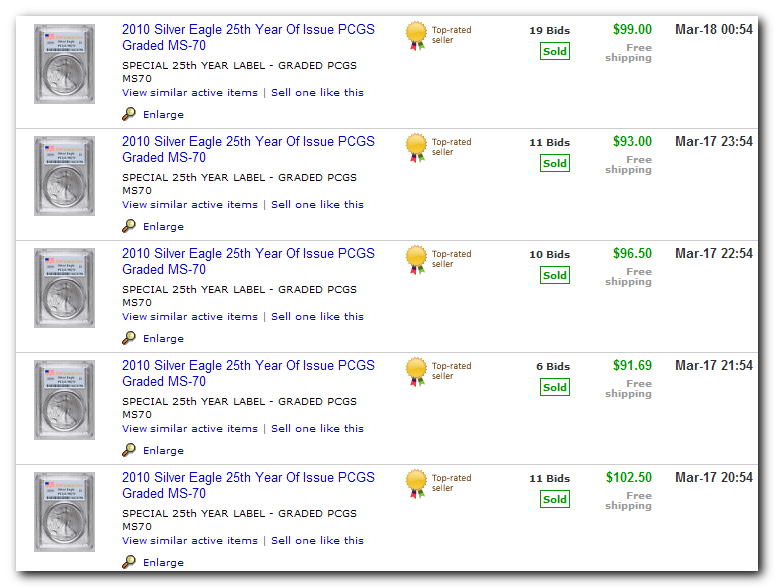 They felt they were getting a good deal, apart from the MLM, in receiving a PCGS MS-70 Silver Eagle for $90 each month. They felt it was a good way to add to their collection. I was dubious about it being a good deal at first and looked on eBay to see how much recent auctions had gone for. As you can see below, it’s not a bad deal. You might get it for a tad cheaper, but you might have to pay a little more. In summary, I’d rather pay a little more to have the ability to pick and choose what I buy, but that’s my personal preference. If you’ve compared deals and knowingly sign up with NumisNetwork, I applaud you and hope it’s a great experience. For those who are unsure how to get involved in coin collecting, I still maintain that NumisNetwork isn’t the best way. I’m writing my very first eBook and it will be available to buy on this site in the very near future. I’ve been working on it for the past few weeks. What was originally going to be a weekend task has taken much longer. I have a problem with never being happy with my work. I know it’s never going to be perfect, but I get in an endless cycle of writing and revising. I’m really excited to see what you guys (and gals) think and that’s motivating me to accept that it’s good enough to release. And I remind myself that I can always update it with improvements and additions later on. To celebrate the eBook launch I’m giving some books and a coin away for free (you don’t have to buy an eBook to win something). If you’re not already on the list, make sure you subscribe to have a chance at the free stuff.